February 20, 2017 10:31 am. The Oakleigh Plate is a group 1 horse race ran over 1100m at Caulfield with a total purse of $500,000. The popular sprint race generally features some of the best sprinters in Australia and the past winners list features some huge names, including Fastnet Rock (2005) and Eagle Falls (2011). 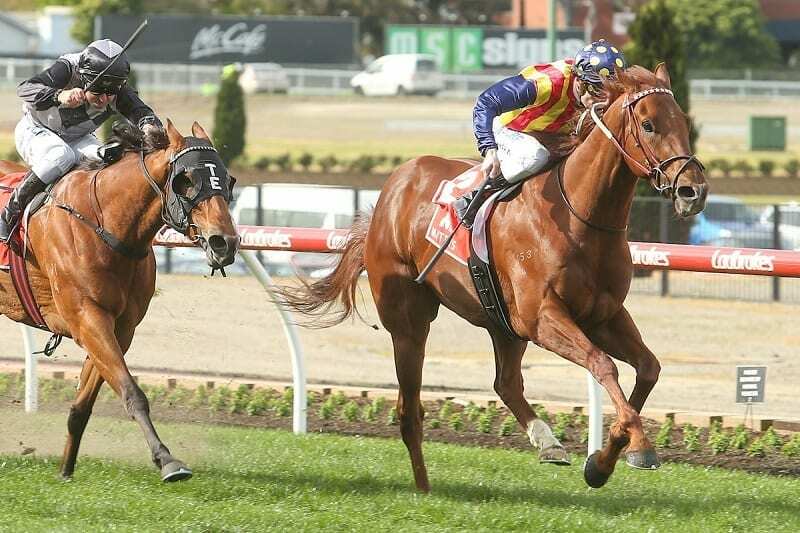 The race is the middle peg of the Melbourne Autumn Carnival sprinting series which also features the Group 1 Lightning Stakes and the Newmarket Handicap. Race under handicap conditions, the Oakleigh Plate has only ever had four winners which have carried more than 55.5kg over the journey. Superstar sprinter Nature Strip is the $2.25 favourite at online bookmaker Sportsbet to win the 2019 Oakleigh Plate. Graff and Zousain are locked on the second line betting at $7 while Eduardo is on the fourth line of betting at $8. Bons Away and Shoals ($9) are the only other runners in single figures. When it comes to wagering on horse racing in Australia we have plenty of options with all the major corporates offering odds on every metro and TAB regional meeting across the country. The Autumn Carnival is exceptionally popular with horse racing fans so there is generally a good spread of available bookie bonuses and other promotions surrounding events like the Oakleigh Plate. Futures markets are not generally released on the Oakleigh Plate as their are no lead up races of note, so betting interest doesn’t really peak until the fields are released in the week before the event. Surprisingly the winner of the Lightning Stakes (1000m) is yet to race in and win the Oakleigh Plate. In fact only two horses — Starspangledbanner and Swiss Ace — have won the Lightning Stakes and raced the following week, with neither having any success. One possible indicator is that fresh horses have a very good record in the race, with five of the last 10 winners being first up. Three of the other five were second up, which indicates that horses at the tail end of a campaign will not fare as well as fresh horses. 2019: The pre-race chatter was about Nature Strip heading into 2019 but the star sprinter’s race was run at the 200m mark, allowing the off-pacers to lay their claims. Booker was running in the middle of the pack but produced a powerful run the final 100m to win, holding off the fast-finishing Encryption and the brave Eduardo. 2018: Russian Revolution was the easing favourite coming into the Oakleigh Plate but those who followed the Snowden runner into the Plate were not disappointed. The horse looked to be traveling smoothly coming up to the turn but when Snitty Kitty threatened to run away with the race Mark Zahra had to push the button. Eventually Russian Revolution wore down the Kitty and won by half a length. 2017: Sheidel was well-backed in the lead-up for the 2017 Oakleigh Plate and the punters got it right on the money. The Lindsay Park-trained mare went forward from the barrier and led them a merry chase. Faatinah tried to close the gap in the straight with race favourite Extreme Choice closing in from well back, but Sheidel had too much in hand in scoring a one-length victory. Read the report here. 2016: Flamberge defied the bookmakers to record a famous victory for Peter Moody and Damien Lane. Jumping at $31 from barrier 15, Flamberge sat in fourth place for much of the run before accelerating to the lead in the straight. It was challenged hard by Fell Swoop ($14) but held on to win by a half head, with Heatherly, the $3.70 favourite, holding on for third after leading the field for much of the race. 2015: It was a famous 1-2 for Aquanita and Robert Smerdon Shamal Wind beating home Under The Louvre. Shamal Wind looked to be out of the race sitting fourth last but blistering final 400m helped the $10 shot beat home stablemate Under The Louvre ($17) while Fast ’N’ Rocking ($18) was a nose third. 2014: Craig Newitt steered Lankan Rupee to a sensational victory which was largely because of a withering run on the straight. Sitting pretty behind leaders Kuroshio and Minaj, Lankan Rupee got the perfect run before powering away at the 400m mark. Spirit of Boom ran home well but was over a length second. Knoydart ($5) ran on well to claim third. Spirit Of Boom jumped at $18 while Lankan Rupee had eased out to $4 on the track. 2013: Mrs Onassis ($16) was too good with jockey Kerrin McEvoy expertly setting up the win after jumping from barrier 12. He immediately crossed with the Gerry Harvey-owned horse to sit outside the leader Adebisi. Despite doing much of the heavy lifting throughout the race, Mrs Onassis beat home Facile Tigre ($15), while Spirit Of Boom ($11) ran on nicely to finish third. 2012: Woorim, trained by Robert Heathcote, came from the clouds to win the 2012 running of the Oakleigh Plate. The $21 shot, trained by Robert Heathcote, defeated the John O’Shea-trained Elite Falls ($51) and Facile Tigre, who was well back in third.